When the Cardinal football players trotted off the University of Phoenix field in January, two different blows were dealt to the Stanford faithful. Losing the Fiesta Bowl to Oklahoma State was the immediate sting, but losing once-in-a-generation quarterback Andrew Luck to the NFL was, in the big picture, the deeper wound. The inevitable question that no one was concerned with suddenly surfaced as one of the most pressing dilemmas for the future of Stanford football: Who’s going to replace number 12 at starting quarterback? Fast-forward to August, and that all-important question remains unanswered with the season opener against San Jose State just over two weeks away. But decision time is looming. 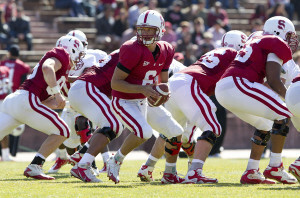 After Saturday’s open practice that consisted of a short scrimmage, head coach David Shaw stated that the starting quarterback would hopefully be chosen sometime this week. Redshirt sophomore Brett Nottingham and redshirt junior Josh Nunes are the two front-runners in the tightly contested race. Nottingham played in six games last season, mostly performing mop-up duty behind Luck. In those appearances, he completed five of eight pass attempts for 78 yards and a touchdown. 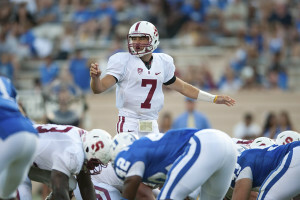 While playing under center for Monte Vista High School in Danville, Calif., he was a four-star prospect and one of the top high-school, pro-style quarterbacks in the country—ranked as high as fourth by Rivals.com. Nunes saw action in four games during the 2010 season as the primary backup quarterback on the depth chart, completing one of two passes for seven yards against Wake Forest. The 6-foot-4 Upland, Calif., native, who be will be entering his fourth collegiate season, was also a four-star recruit and ranked the 13th-best pro-style quarterback in high school by Rivals.com. As former backups, both players voiced great appreciation for the valuable learning experience of playing behind Luck. Given that the Stanford offense contains nearly 300 plays, mastering the voluminous playbook is a quarterback skill that is as important as it is challenging. But both quarterbacks expressed confidence in their understanding of the plays. Nunes believes that knowing the playbook is one of his “strong points” as he has it “pretty down pat.” Although Nottingham has one less season under his belt than Nunes, the redshirt sophomore “feels leaps and bounds more improved” from where he was last year and has become “very comfortable” with the playbook. With the quarterback race going right down to the wire, the intensity of the atmosphere can hardly be downplayed. Yet the competition also hinges on a tremendous sense of mutual respect between the two players. Both players have also shown a great level of humility throughout preseason camp. Nottingham acknowledges that he hasn’t “arrived” as an “established player” yet, while Nunes recognizes the importance of improving on timing routes with his wide receivers and tight ends. And though they are the two favorites in the pursuit for the starting role, redshirt freshman Kevin Hogan has recently emerged as a dark-horse candidate. Shaw made it clear that the Cardinal will not adopt a rotation system for the position, which would involve the quarterbacks splitting playing time, at least early in the season. Picking one quarterback remains a difficult task, but time is running out. Regardless of which player will be chosen to start, he won’t be expected to control plays at the line of scrimmage to the same extent that Luck did as master of the offense. But even with those limitations in place, the coaching staff is still holding the competing quarterbacks to a high standard during the preseason and beyond. The starting quarterback this season might not be the next number 12, but he will be the player chosen through the methodical selection process that Shaw and the coaching staff have implemented. Whether it’s Nottingham, Nunes or Hogan who’s named as the successor, the reins of the Cardinal offense will assuredly be passed to a quarterback who has already been heavily tested by the intense competition for the job. 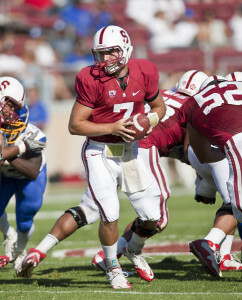 That gives Stanford football as good a chance as any to win come game day.